I've included any Ian Allan rail maps & atlases here, since the first British Railways editions didn't have ABC written on, although the smaller sized books did; all these were by M G Ball, all the rest are a larger format. 1948 British Railways Sectional Maps, published 1948. 68pp (37 pages of maps), no code. Large format. Cover photo of LMS 'Royal Scot' Class 4-6-0 6153 "The Royal Dragoon" without smoke deflectors. 1948 Sectional Maps of the British Railways, published 1948. Large format, hardback, pale green. This is a different book from the previous 1948 publication. 1948 Sectional Maps of the British Railways, published 1948. Large format, hardback. This version is pale blue with dark blue binding. 1958 British Railways Pre-Grouping Atlas and Gazeteer, by W Philip Conolly, published January 1958, 84pp 21/-, Code: 700/50/158. Hardback, ringbound. 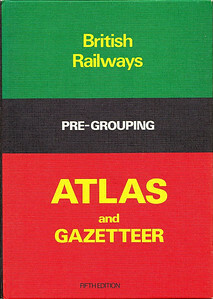 1960 British Railways Pre-Grouping Atlas and Gazeteer, 2nd edition, by W Philip Conolly, 84pp 21/-. Large format, softback. Large format. 1965 British Rail Atlas and Gazetteer, published 1965. Large format, ring-bound. 1967 Sectional Maps of British Railways, published 1967. Large format, ring-bound (see also next photo). 1967 Sectional Maps of British Railways, published 1967. Large format, ring-bound. Note different style of binding to that in the previous photograph. 1976 British Railways Pre-Grouping Atlas and Gazetteer, 5th edition, published January 1976, 84pp £5.50, code: EX/0176, ISBN 0-7110-0320-3. Hardback, 9.5" x 6.75". A new edition, published in 1997, utilised the same cover, and ISBN. 1981 Sectional Maps of the British Railways, with Gazetteer, as at December 1947, published May 1981, 53pp £2.95, ISBN 7110-1156-7. Large format, softback. 1982 Sectional Maps of British Railways, as at January 1982, with Gazetteer, 1st edition, published 1982, 48pp, ISBN 0-7110-1257-1. Large format, softback. 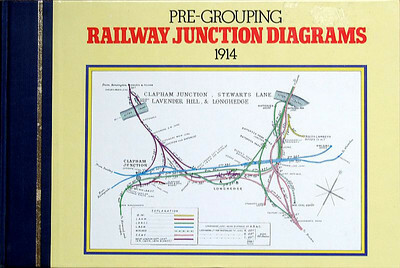 1983 Pre-Grouping Railway Junction Diagrams 1914 (Railway Clearing House), published 1983, 160pp £12.95, ISBN 0-7110-1256-3. Hardback, 25.5cm x 16.7cm. 1985 Sectional Maps of British Railways, with Gazetteer, 2nd edition, published 1985, 46pp £3.95, ISBN 0-7110-1458-2. Large format, softback. 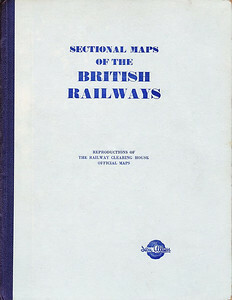 1989 Sectional Maps of British Railways, with Gazetteer, 3rd edition, published 1989, 64pp £5.95, ISBN 0-7110-1799-9. Large format, softback. 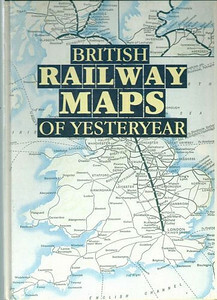 1991 British Railway Maps of Yesteryear, published 1991, 64pp £12.95, ISBN 0-7110-2019-1. Hardback, large format 8.5" x 12". 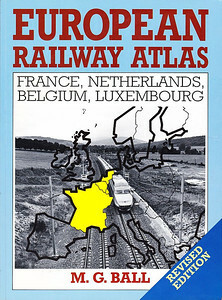 1991 European Railway Atlas: France, Netherlands, Belgium & Luxembourg, by M G Ball, published 1991, 96pp £9.95, ISBN 0-7110-2011-6. Large format, softback. 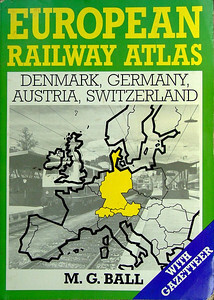 1992 European Railway Atlas: Denmark, Germany, Austria & Switzerland, by M G Ball, published 1992, 128pp £9.95, ISBN 0-7110-2116-3. Large format, softback. 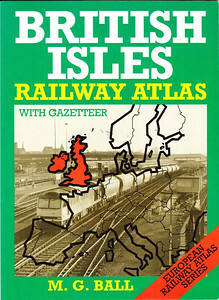 1992 British Isles Railway Atlas with Gazeteer, by M G Ball, published 1992, 48pp £6.95, ISBN 0-7110-2048-5. Large format, softback. 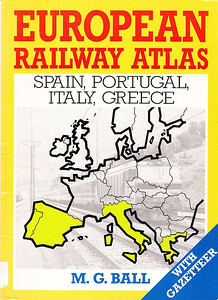 1993 European Railway Atlas - Spain, Portugal, Italy, Greece, by M G Ball, published 1993, 80pp £10.99, ISBN 0-7110-2087-6. Large format, softback. 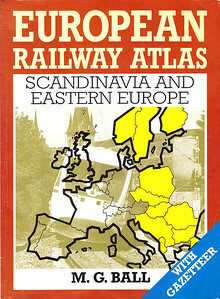 1993 European Railway Atlas - Scandinavia and Eastern Europe, by M G Ball, published 1993, 70pp £10.99, ISBN 0-7110-2172-4. Large format, softback. 1994 European Railway Atlas - France, Netherlands, Belgium, Luxembourg, by M G Ball, published June 1994, 96pp £10.99, ISBN 0-7110-2328-X. Large format, softback. 1995 European Railway Atlas - British Isles, by M G Ball, 2nd revised edition, published November 1995, 55 maps + index £10.99, ISBN 0-7110-2407-3. Large format, softback. 1995 British Railways Atlas, 1st edition, by M G Ball, published May 1995, 80pp £5.99, price increased to £7.99, ISBN 0-7110-2339-5. Released as a BCA edition in 1996. Pocket-sized. Cover photo of an InterCity-liveried HST. 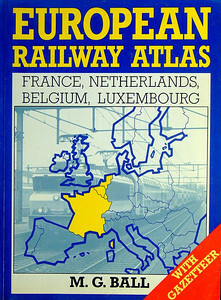 1997 European Railway Atlas, 1st edition, by M G Ball, published 1997, 128pp £7.99, ISBN 0-7110-2523-1. Pocket-sized, softback+. Cover photo of an SNCF TGV Atlantique set. 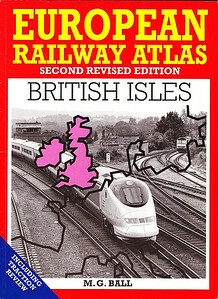 1998 British Railways Atlas, 2nd edition, by M G Ball, published June 1998, 80pp £8.99, ISBN 0-7110-2568-1. BCA edition published the same month. Pocket-sized. Cover photo of NSE-liveried DMU 165 124. 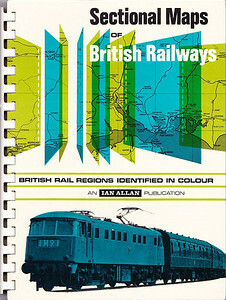 2000 British Railway Atlas 1955, published 2000, 96pp £14.99, ISBN 0-7110-2726-9. Large format. 2000 Atlas of Train Operating Companies, 1st edition, published 2000, 64pp (45 maps + index), £14.99, ISBN 0-7110-2717-X, no code, large format. 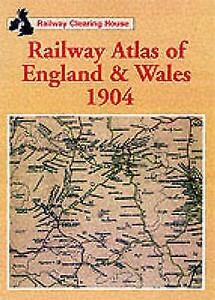 2001 Atlas of England & Wales 1904 (Railway Clearing House), published 2001, 64pp (41 maps + index), £14.99, ISBN 0-7110-2778-1, large format. 2001 Atlas of London, 1935 (Railway Clearing House), published July 2001, 64pp (45 maps), ISBN 0-7110-2789-7, large format. 2002 Sectional Maps of Britain's Railways (hardback), published September 2002, 64pp (unpriced), ISBN 0-7110-2878-8, code:0209/B2. Large format. Cover photo of SWT 159 021 passing an EWS Class 66 diesel at Eastleigh. 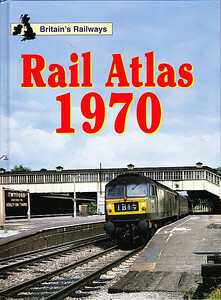 2003 Rail Atlas 1970, published 2003, 64pp (45 maps) £14.99, ISBN 0-7110-2726-9. Large format. Cover photo of Brush Type 4 (Class 47) D1529 at Twyford. 2004 British Railways Atlas, 3rd edition, by M G Ball, published July 2004, 96pp, ISBN 0-7110-3059-6. Pocket-sized, softback. Cover photo of a Railfreight-liveried Class 90 electric at Norwich. 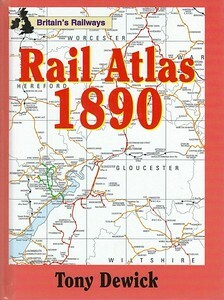 2005 Rail Atlas 1890, by Tony Dewick, 1st edition, published 30th June 2005, 80pp £16.99, ISBN 0-7110-3031-2. Hardback, larger format 23.5cm x 17.2cm. 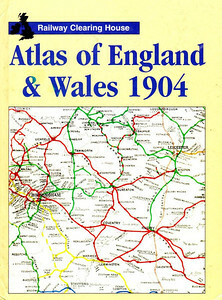 2005 Atlas of England & Wales 1904 (Railway Clearing House), reprint of 2001 edition, published 2005, 64pp (41 maps + index), £14.99, ISBN 0-7110-2778-1, large format. Different cover to the 2001 edition, and has the word 'Railway' added in the title, same ISBN. 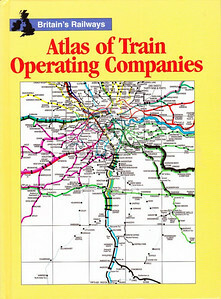 2006 Atlas of Train Operating Companies, 2nd edition, published 2006, 62pp (45 maps) £14.99, ISBN 0-7110-3138-X. Large format. Cover photo of a Class 460 'Gatwick Express' EMU and a Southern Trains Class 377 EMU at Clapham Junction. 2009 London Railway Atlas, 2nd edition, by Joe Brown, published July 2nd 2009, 104pp £8.14, ISBN 0-7110-3397-8. Hardback, larger format 30.3cm x 21.8cm. 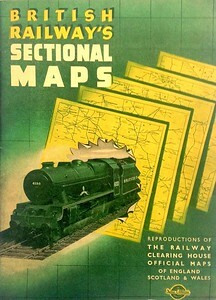 2011 British Railways Atlas 1947, published 2011, 56pp (39 maps) £10.99, ISBN 0-7110-3643-8. Front cover has the crests of 'The Big Four'. Large format, softback. 2012 London Railway Atlas, 3rd edition, by Joe Brown, published August 2nd 2012, 128pp £12.72, ISBN 0-7110-3728-0. Hardback, larger format 30cm x 21.2cm. Cover photo of Borough Market Junction. 2012 Railway Atlas Then and Now, 1st edition, by Paul Smith & Keith Turner, published August 2012, 112pp (99 pages of maps) £19.99, ISBN 0-7110-3695-0. Hardback, large format. Maps are from 1st January 1923 and 1st January 2012. 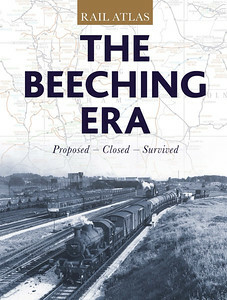 Rail Atlas: The Beeching Era, published September 5th 2013, 112pp £20.00, ISBN 0-7110-3549-0. Hardback, larger format 21.4cm x 28.2cm. Cover photo of Carlisle Kingmoor. 2014 Rail Atlas 1939-1945, published January 9th 2014, 96pp £18.99, ISBN 0-7110-3630-6. Hardback, larger format 17.4cm x 23.8cm.